The Nevada Wolf Pack take on the Fresno State Bulldogs on Thursday at Bulldog Stadium. The opening line for this game has Nevada as 3.5 point favorites and the over/under was set at 56.5. Tyler Stewart finished his last game with 128 yards through the air for Nevada. He completed 12 passes out of 23 attempts for a 52% completion percentage. The Wolf Pack were led in rushing by James Butler, who finished with 134 yards on 28 rushes. He ended the contest with an average of 5 yards per carry. Jarred Gipson led the team in receiving with 5 receptions for 57 yards. He had an average of 11 yards per reception in the contest. As a team in that game Nevada got a total of 20 first downs by way of 13 rushing, 6 passing, and 1 by penalty. They ran 79 total plays for 372 yards for the game. The Wolf Pack ran for 244 yards on 56 attempts. 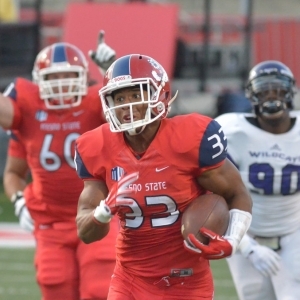 Kilton Anderson finished his last game with 177 yards through the air for Fresno State. He completed 14 passes out of 39 attempts for a 36% completion percentage. The Bulldogs were led in rushing by Marteze Waller, who finished with 80 yards on 10 rushes. He ended the contest with an average of 8 yards per carry. Marteze Waller led the team in receiving with 2 receptions for 40 yards. He had an average of 20 yards per reception in the contest. Fresno State got a total of 12 first downs by way of 3 rushing, 9 passing, and 0 by penalty. They ran 56 total plays for 311 yards for the game. The Bulldogs ran for 134 yards on 17 attempts. Nevada is scoring 25.6 points per game on offense this season. In the passing department, they are averaging 16.5 passes on 29.3 attempts for a 56.4 percent completion percentage this season. They throw for a total of 175.1 yards per game through the air as well. The Wolf Pack carry the ball for an average of 212 yards per game on 42.5 attempts for an average of 5 yards per carry this season. They also run 71.8 plays per contest and average 5.4 yards per play for an average of 387.1 yards per game. The Wolf Pack are averaging 21.5 first downs per game and they accumulate 51.6 penalty yards per game via 5.4 penalties. Nevada gives up an average of 240.4 passing yards and 26.8 points per game on the defensive side of the ball. They allow 22.8 completions per game on 33.3 attempts for a completion percentage of 68.4. The Wolf Pack allow 172.5 rushing yards per game on 37.6 carries for a 4.6 average per play. Nevada allows 412.9 total yards per game including 5.8 yards per play. They force 1.6 turnovers per contest and get flagged for 6.4 penalties for 59 yards per game. Fresno State averages 21 points per game this season on offense. In the passing department, they complete 16 passes per game on 31.5 attempts for a 50.8 percent completion percentage. They are throwing for 166.1 yards through the air per game thus far. The Bulldogs carry the ball for an average of 130.6 yards per game on 33.5 attempts for an average of 3.9 yards per carry. They also run 65 plays per game and average 4.6 yards per play for a total of 296.8 yards per game. The Bulldogs get an average of 15.4 first downs per game and they average 37.9 penalty yards per game via 4.4 penalties. Fresno State gives up 205 passing yards per outing and 40.9 points per game on the defensive side of the ball. They allow an average of 17.1 completions on 25.6 attempts per game for a completion percentage of 66.8. The Bulldogs allow 239.1 rushing yards per contest on 50 carries for a 4.8 average per rush. Fresno State allows 444.1 total yards per game for an average of 5.9 yards per play. They force 1.5 turnovers per contest and 4.4 penalties for 37.6 yards in each contest.